Officially known as the Assistant to the President for National Security Affairs, the National Security Advisor—the more commonly used title—has a role defined as much by the chief executive as by law. The position did not exist as such for more than a decade after the establishment of the National Security Council (NSC), nor does that legislation mention the role of the advisor. Yet, as the chief counsel to the president on matters of national security, the advisor holds a role of unquestioned significance. Beginnings of the NSC and the advisor's role. The enabling legislation for the NSC, the National Security Act of 1947, created the body to serve as advisory board to the president on domestic, foreign, and military matters involving national security, and to facilitate cooperation between agencies on these issues. Intelligence and covert operations were not encompassed in that original mission, not so much because such matters are seldom mentioned in public law, but because at the time of that legislation—which also created the Central Intelligence Agency (CIA)—few guessed the importance these activities would gain in years to come. The 1947 legislation created the NSC as a small permanent staff whose director would be an executive secretary appointed by the president. Nowhere was it stated that the president required to submit this appointment for Senate confirmation. In future years, this would keep the role of National Security Advisor independent from the inner politics, not only of the legislative branch, but also of the executive branch. Removed from Congress and the bureaucracy of the State and Department of Defense, the Advisor would be the president's own counsel. Ironically, in 1947, these other centers of power each viewed the new council as advancing their own interests, but none could have guessed the changes that would take place. For example, a 1949 reorganization of the NSC reduced the influence of the Department of Defense by removing the three service secretaries (army, navy, air force) from its membership. And while President Dwight D. Eisenhower created the role of President's Special Assistant for National Security Affairs, the position had little of the significance the National Security Advisor took on under President John F. Kennedy. The years from Kennedy onward have seen each president personalize his administration in part through his appointment of the National Security Advisor, and in smaller measures through aspects of the NSC itself. Bundy, under Kennedy and later Lyndon B. Johnson, was the first powerful National Security Advisor, but his influence appears minimal compared to that of the most powerful individual ever to hold the position: Henry Kissinger. Emblematic of Kissinger's role was the fact that for part of his tenure as National Security Advisor to presidents Richard M. Nixon and Gerald R. Ford, he also served as Secretary of State. From the Nixon era onward, presidents have likewise placed their personal stamp on the NSC through presidential directives, classified orders often drafted with the assistance of the National Security Advisor. These orders became known, in turn, as National Security Decision Memorandums (Nixon and Ford), Presidential Directives (Carter), National Security Decision Directives (Ronald Reagan), National Security Directives (George H. W. Bush), Presidential Decision Directives (William J. Clinton), and National Security Presidential Directives (George W. Bush). Best, Richard A. The National Security Council: An Organizational Assessment. Huntington, NY: Novinka Books, 2001. Felix, Antonia. 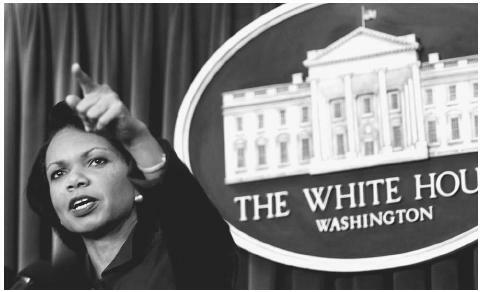 Condi: The Condoleeza Rice Story. New York: Newmarket Press, 2002. Hillen, John. Future Visions for U.S. Defense Policy: Four Alternatives Presented as Presidential Speeches. New York: Council on Foreign Relations, 1998. Kissinger, Henry. Problems of National Strategy: A Book of Readings. New York: Praeger, 1965. Powell, Colin L., and Joseph E. Persico. My American Journey. New York: Ballantine Books, 1996. Official Intelligence Documents. American Federation of Scientists. < http://fas.org/irp/offdocs/ > (March 24, 2003).